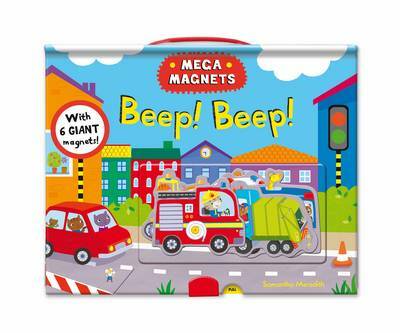 There are 6 giant magnets to play with in this fantastic super-sized magnet book! It's perfect for vehicle-crazy youngsters with everything from fire engines and ambulances to diggers and even a rubbish lorry. The story pages at the beginning are packed with just the right level of detail to capture their interest, and are perfect for sharing with a parent. Then fold out the two playspreads and either follow the matching tasks, or let your imagination run wild and take the magnets on the road, creating your very own combinations and scenes.